Louis-Ulysse Chopard would doubtless be delighted to see how his company has developed. Celebrating its 150th anniversary in 2010, the firm is still pervaded by the spirit instilled in it by its founder and nurtured by a blend of fine hand craftsmanship and daring technical developments. From the founding family to that of Karl Scheufele which took it over in 1963, Chopard continues to be governed by its enduring principles, including a taste for excellence, the pursuit of quality, creativity, innovation, independence, and fundamental human respect. Founded in 1996, Chopard Manufacture, the Haute Horlogerie entity of Chopard, results from the unswerving determination of Karl-Friedrich Scheufele who became convinced at an early date that the company should make its own watch movements. Years of relentless effort have resulted in the L.U.C calibre collection. 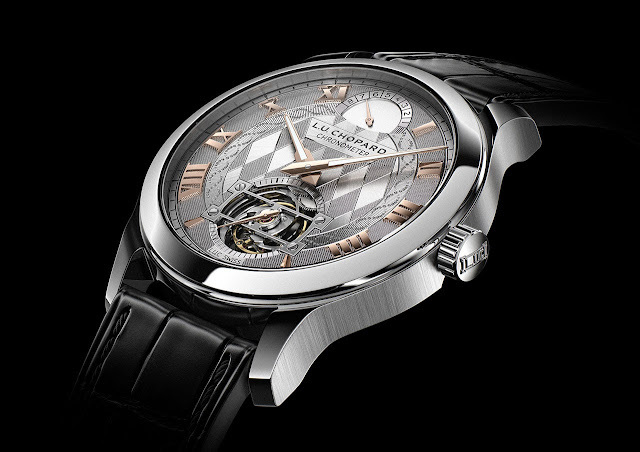 These three initials representing a tribute to the brand founder Louis-Ulysse Chopard are conferred on a series of exceptional movements. Within a few years, 10 base calibres and more than 60 versions were designed and produced, representing a substantial achievement for such a young manufacture. The one-of-a-kind platinum tourbillon features an exclusive hand-engraved dial and movement and is equipped with the 9-day power-reserve L.U.C Calibre 02.17-L. Ref. 161929-9001. Case: Its generously sized 43 mm-diameter platinum case offers contrasting polished and satin-brushed surface finishes and its transparent case-back provides ample views of the hand-crafted movement. 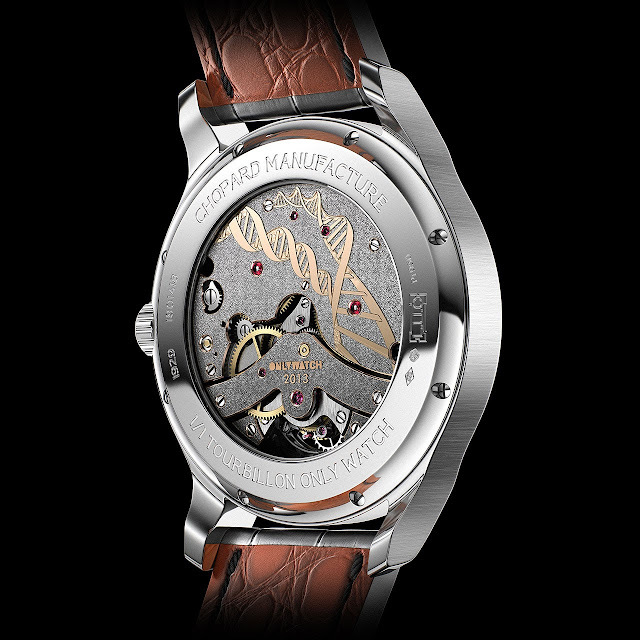 Dial: The silver-toned and white dial has been hand-decorated and its central motif represents the coat-of-arms of the Principality of Monaco, surrounded by DNA chromosomes. In addition to the personalised gold-toned “Dauphine” style hands, the hours are displayed as Roman numerals – 1960s inspired delicate golden appliques – framed by a black transferred railtrack graduation. Movement: The 18-carat gold bridges of L.U.C Calibre 02.17-L are entirely decorated using the so-called fleurisanne engraving technique, an artistic craft which, from the late 18th century onwards, forged the success of its native village of Fleurier and contributed to spreading its reputation as far as afield as China. Now all but extinct, fleurisanne engraving is distinguished by its raised motifs, since the engraver’s work consists not in sculpting by hollowing, but instead in sparing the motif and removing the material surrounding it in order to make it stand out. The motif representing DNA chromosomes serves as a reminder of the reason behind this charity auction: to support research on Duchenne muscular dystrophy, a degenerative neuromuscular disease. Equipped with a tourbillon carriage, a clever device designed to enhance the precision of the movement by releasing its escapement from the detrimental influence of gravity, the calibre earned the certification awarded by the Swiss Chronometer Testing Institute (COSC) and corresponding to the highest standards of timing precision. It displays the essentials: hours, minutes, small seconds and a power-reserve indicator at 12 o’clock.